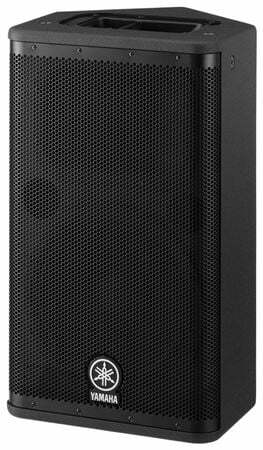 Shop Yamaha DSR112 12 Inch Powered PA Speaker from AMS with 0% Interest Payment Plans and Free Shipping. The Yamaha DSR112 takes portable active loudspeakers to the extreme limits of their potential. 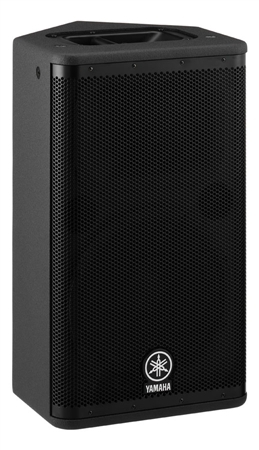 The DSR112 is a 12 inch bi-amped speaker powered by high power Class-D amplifiers, 1300 watts total (LF 850W, HF450W). Designed through the application of advanced Yamaha digital and acoustic technologies perfected over several decades, DSR112 provides a listening experience that redefines high definition sound reinforcement. Ideal combination of ultra-precise 48-bit digital sound processing, advanced electronic and acoustic technologies delivers unparalleled high definition sound. TD-CONTOUR multi-band dynamic processing with intelligent sensing provide the ideal balance of dynamic sound with consistent clarity at any output level. Extremely powerful Class-D amplifiers featuring PFC full-resonance switching-mode power supply help deliver class-leading maximum SPL. Extensive DSP-controlled protection ensures reliable operation of all internal components: transducers, power amplifiers and power supplies. The DSR development team took full advantage of a number of advanced digital technologies, both new and refined, based on Yamaha’s extensive experience accumulated over many long years of developing professional audio equipment. Leading-edge digital technological innovations incorporated into the DSR Series loudspeakers include Integral Digital Tuning, Intelligent Dynamic Control, Powerful Digital Drive and Extensive DSP Protection. These four D technologies combine to make possible the extreme performance capabilities of the DSR Series, hence the name: Xtreme D is born. The digital crossover networks employ high-order FIR (Finite Impulse Response) filters that provide linear phase response. Yamaha’s proprietary FIR-X tuning simultaneously optimizes frequency and phase response, while adjusting the time alignment between the HF and LF transducers. The end result is sound quality with much better clarity and imaging than is possible with typical crossovers. High Performance Digital Signal Processor and 24-bit Discrete AD and DA Converters. 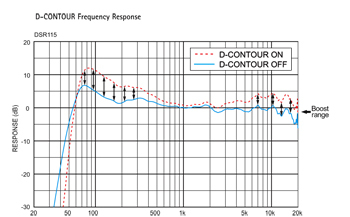 D-CONTOUR is a multi-band dynamic processor featuring intelligent sensing. Normally a compressor is used to boost SPL, but this would effect the entire audio bandwidth resulting in a constricted feel to the sound. D-Contour works by constantly monitoring the output of multiple frequency bands, feeding the data back into the intelligent sensing system. This system then calculates the optimum EQ adjustments for each frequency band, resulting in maximum SPL while maintaining musicality. These EQ adjustments are performed in a highly intelligent manner, linked directly to the auditory response of the human ear. Hence the DSR Series can continuously deliver sound that is natural, clear and powerful - regardless of volume. D-CONTOUR can be turned on or off depending on the acoustic environment and type of sound desired. The DSR Series employs a high efficiency switching-mode power supply with PFC. PFC harmonizes the phases of the load current and power supply voltage, maximizing power output and ensuring stable operation under severe conditions. The full resonance switching method uses both voltage resonance and current resonance, creating a clean power supply waveform with minimal high frequency noise. This clean, efficient power supply enables the entire speaker system to achieve its full performance potential. The heat sink uses super-efficient cooling fins and is integrated with the aluminum diecast rear panel. Circuit boards are installed on the back of the rear panel, with all parts including the DSP, amplifiers and power supply laid out to ensure maximum heat conductivity. With the entire structure dedicated to preventing heat buildup, the service lifetimes of all components are significantly increased. Furthermore, the internal structure is designed to achieve the highest sound quality. For example, the DSP unit is completely shielded to separate it from the amp and power supply, preventing noise interference. To ensure the highest possible reliability, the DSR Series employs many of the same protection functions used in our top-class TXn Series professional power amplifi ers. These functions protect all aspects of the power supply, power amplifi er modules and transducers so that they can operate to their full potential while ensuring reliable operation even under the most severe conditions. * The DSR118W is protected by an analog circuit. Each DSR Series loudspeaker has a white LED behind the front grille. When engaged, the LED illuminates while the power is on and also indicates the onset of system limiting. In addition, the brightness varies depending on the amount of limiting, so it is easy to monitor the status of the speaker from in front of the speaker system. This makes it easier to ensure that your mixer level is optimal, so you get the best sound from your DSR. 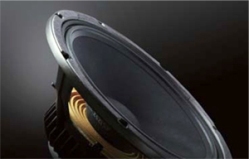 The transducer is all important in determining the sound quality of a speaker. 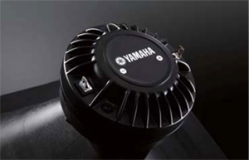 For the DSR Series, Yamaha thoroughly analyzed a wide range of transducers, choosing low-distortion units that provide extremely flat frequency response, wide dynamic range and high power handling. They were further customized to match the properties of each speaker’s cabinet and power amplifier combination. The result is a loudspeaker system with impressively deep bass, exceptionally clear mid-range and accurate high frequencies up to 20KHz. The high frequencies of all full range models are handled by a 2 inch titanium diaphragm neodymium compression driver capable of reproducing incredibly transparent, accurate high frequencies up to 20kHz. The 2 inch voice coil is large for this class of speaker. It provides high power handling for powerful sound with low distortion even at high outputs. The HF transducers use lightweight, compact neodymium magnets, significantly contributing to the low weight of the loudspeaker system for easy portability. Thanks to these high performance components, the DSR Series exhibits superior dynamics even at high volumes and extremely clear vocals for superb performance in a wide range of environments, from small venues to large halls and outdoor PA. The DSR Series cast aluminum woofers boast a large 3 inch voice coil*, and the DSR112 and DSR115, designed for easy portability, have light, strong neodymium magnets. This makes the speakers lightweight yet capable of delivering awesome power with warmth and deep bass response. The woofers’ superior bass range control and reproduction of mid-bass vocal presence produces fast, powerful bass that does not affect the contour, achieving sound with minimal distortion, even during high volume outputs. * DSR112/115/118W. The DSR Waveguide Horn was designed with the goal of minimizing the radiation pattern deterioration in oblique directions seen in conventional horns in order to achieve a more ideal coverage area without irregularities. With the new Wide Dispersion CD Waveguide Horn, sound expands in a more rectangular pattern, providing 90° horizontal x 60° vertical coverage with wide frequency sound projected all the way to the edges of the coverage area. This uniformly balanced output and high sound quality throughout the listening space maximizes audience satisfaction. The easy-to-handle, flexible DSR Series models are well suited for various specific needs, making them ideal for a wide range of professional applications. The DSR112 and DSR115 cabinets have a 35mm pole socket for stand or pole mounting and integrated M10 rigging points for suspended applications with standard eyebolts (not included). The DSR112 can be angled for use as an onstage floor monitor and additional monitors can be daisy-chained via the XLR THRU socket on the rear panel. All full-range models also feature XLR and 1/4 inch TRS jack inputs that accept both mic and line level inputs. You won’t find a better speaker in the price range. 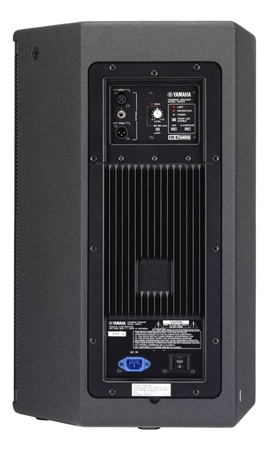 The Yamaha DSR112 is an outstanding sounding speaker. 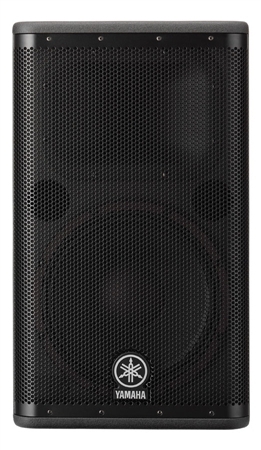 I have had or mixed on almost every powered speaker out there and I can say these are one of the best. As stated before in this price they are the best. I used to be a JBL fan and have had the PRX600, PRX700, SRX700, SRX800 and Vertec lines. I did a side by side with my JBL SRX812P outdoors and ran then both to there limiter and the the DSR112 not only sounded better but was louder and more audible at 150 feet away. For $400 cheaper, small and lighter, I would pick the DSR anyday. Yamaha has a real winner here. AMS gave me a great deal and it was at me house the next day. The loudest powered 12" speaker i've heard in its price range. I bought the DSR 112 after months of research. The one thing I kept reading was how loud it gets without distorting and it's true now that I own a pair. You have plenty of headroom as long as you have the "HPF" button engaged. Now having said that, this speaker is not known for being a stand alone. You'll definitely need a subwoofer. Without the "HPF" button engaged on the back, you'll be hitting the limit light quicker if you get too loud. Also, it only has one handle at the top. For me it isn't a problem I just grab it by the sides but overall, the size, weight and sound overrides that. In conclusion i'm happy with my purchase and will buy more. This speaker is loud ! I own the Yamaha DSR115 and was amazed all the output and clarity they possessed. I wanted to try the DSR112 to use under my subs. These are a perfect match. It's hard to get these speakers to limit. You can drive these hard all night and melt faces. I'm saving up to buy 2 more. AMS also has the best prices too. The best powered 12 cab that I've heard!this cabinet will not let you down. Nexo 's calaberation with Yami is a winner. I let a pair of these go And I was disappointed that I did. Now, I have purchased another pair. And plan to be happy for years to come. Add a sub and you are ready for most Any gig. Won't let go of these again! I have own these speakers for one year now. I wanteed to wait before I did a review. After lots of events with them I am very confident in this product. These speakers look as great as they sound. The small led in the front is a very nice touch or you can disable the light with a simple click. I use them for weddings and they blend in very well with out being so bulky in apperance. Setting these speakers on sub mouns are a little difficult. The handle is located on top of the speaker. You can mount them with only one person, but it will require some balance. The same applies for taking them down. The High pass Filter HPF is great when you add a sub. I have played them at high volumes for hours straight with no issues. I have these paired with the DSR118 and they sound great! It is a really full sound. Build quality seems very good. I own other PA Yamaha stuff that have withstood the test of time. Tone is the best feature of this powered speaker. Nothing spectacular, just clear and loud, and it's better than its competitors since the louder it gets the best it sounds. No bells and whistle. Just everything required. BEST SPEAKERS AHEAD OF IT'S TIME!! !